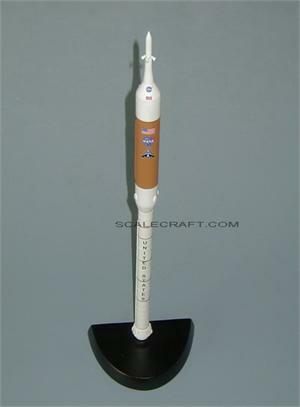 Ares I is the crew launch vehicle being developed by NASA as a component of the Constellation Program. The name "Ares" refers to the Greek deity Ares, who is identified with the Roman god Mars. Ares I was originally known as the "Crew Launch Vehicle" (CLV). NASA plans to use Ares I to launch Orion, the spacecraft being designed for NASA human spaceflight missions after the Space Shuttle is retired in 2010. Ares I is intended to complement the larger, unmanned Ares V, which is the cargo launch vehicle for Constellation. NASA selected the Ares designs for their anticipated overall safety, reliability and cost-effectiveness. Mahogany wood. Scale: 1/200. Length 21 inches.